"Wow, women are really something!" Expressed through one tiny line of dialogue, this sentiment nevertheless forms the foundation of Iwaki Kei's Farewell, My Orange. Reflective of Kei's own journey, the novel is set in Australia, where the author emigrated from her native Japan 20 years ago, and spotlights the experience of immigrant women. Salimah fled ongoing conflict in Nigeria with her husband and sons, in fear for their lives. Although safer, Australia is strange. With her different language and skin color, Salimah feels great weight on her shoulders as she labors daily cutting and packaging meat. Similarly adrift is Sayuri, despite arriving under different circumstances. She and her professor husband moved from Japan for his career, and she is expecting their first child. Over the course of several years, Salimah and Sayuri attempt to bid farewell to the known sunsets of their homelands and make way for the new women they are wrestling to become. 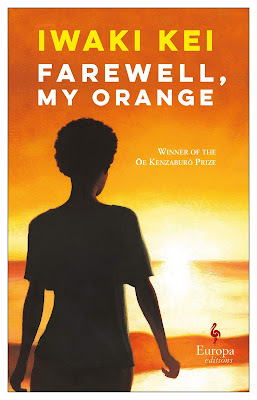 Through third-person narrative and letters from Sayuri to her writing teacher in Japan, Farewell, My Orange beautifully renders the women's ebbing and flowing strength through suffering. As their paths cross in English-language classes, the twists of life bring joy, pain, success and tragedy that further hone their experiences and relationships. Kei's work won the Kenzaburō Ōe Prize, created by publishing house Kodansha to honor Nobel laureate Ōe and promote Japanese literature worldwide. Translation to English (wonderfully done here by Meredith McKinney) is part of the prize, and the poignant turns of this slim volume are worthy of a broader audience. STREET SENSE: A difficult and tender look at the lives of immigrant women from varied backgrounds as they forge new lives in Australia. Includes some beautiful twists. A FAVORITE PASSAGE: You know, I'm rather like a dog. I wear a collar called 'loyalty,' and the chain that's attached to it can never be severed from the native land that is my master. The day I grow so skinny and decrepit that the collar slips from my scrawny neck, the day the rusted old chain suddenly snaps, will probably be the moment I leave this world, when for better or worse I'm freed of my native land and lost to patriotism. COVER NERD SAYS: I didn't see this cover until the book was published and thus had no preconceptions. However, I would have been drawn to this lovely cover art had I seen it. I love the imagery, color and symbolism all wrapped up in the simplicity.